Electricity & Heating not included metered per amount used. Refundable security deposit payable on arrival. Booking deposit €200.00 balance payable eight weeks before commencement of vacation. A nature lovers paradise, Lough Hyne and its beauty is so enchanting and its marina life so unique and varied, it became IRELANDS FIRST AND ONLY MARINE NATURE RESERVE IN 1979. 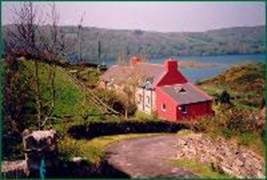 Lough Hyne Cottages and Lands are also within the proposed NATIONAL HERITAGE AND SCIENTIFIC AREA OF IRELAND. · Kitchen/Dining with open stone fireplace and vaulted ceiling with Bay Window. · Oil fired meter operated. Lough Hyne, four miles from Skibbereen, is a unique salt water lake, which is a marine reserve boasting a multiplicity of unusual underwater creatures. It is popular for water sports, such as swimming, scuba diving and canoeing - shooting the rapids which link into the sea. 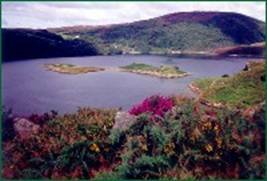 Lough Hyne is surrounded by wooded hillsides, well worth climbing for spectacular views of the lake, coast and islands.